The original was a neat idea, but just felt rushed. Will Konami do right by PSP FPS fans this time around? A common sight on the shelves in your local games emporium is that of the sequel. They flock to the stores en masse, swamping the gamer with a lack of choice and originality, often emitting a generally stale odor. Well, sometimes anyway. There are a lot of times when games spawn sequels and the world rejoices, then on the flipside of the coin there are sequels that appear from games that weren't all that successful. 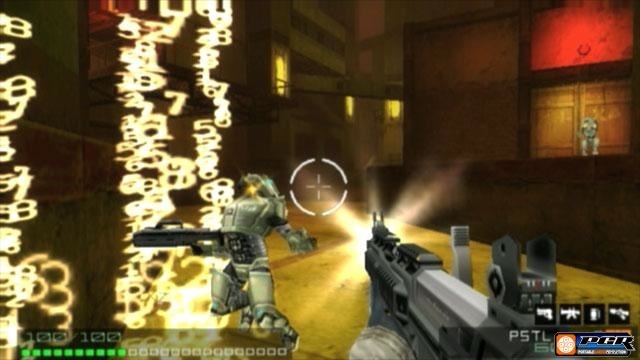 Coded Arms was one of the PSP's early titles, coming just a few months after launch. It was highly anticipated, it looked pretty damn sweet! Then along came the reviews... It was indeed a very pretty game but it turned out that in the rush to get the game out, they had neglected to make it quite so much fun to play. People had issues with the controls, the lack of story and the dullness of the levels. So, this is where the sequel comes in. With a game like Coded Arms, you can see a sequel as the game having a "second bite of the apple". A chance to right the wrongs of the prior game. Coded Arms: Contagion, we hope, is going to be the game Coded Arms was supposed to be. Now, if by any chance you missed Coded Arms first time round, the idea behind the game was that in the near future, there lurks an abandoned Virtual Reality simulation called A.I.D.A (Remember VR yeah? The great nineties idea. Silly helmets and gloves for playing games? No? Well, It didn't really catch on. ), used primarily for military training purposes. You played as a naughty hacker person, up to no good as usual, attempting to raid the simulation and steal military secrets to sell on the black market. Sounds pretty cool no? Problem was, the levels were randomly generated. Theoretically meaning the game would never be the same twice. The reality of it? A never ending procession of box rooms with obstacles and enemies thrown in for good measure. Bah! Ok, time to don the hat of positivity and take a look at Coded Arms: Contagion. This time round the game has more of a structured storyline. You play the part of Grant, a military agent, inserted into the A.I.D.A. Simulation system in order to combat terrorists who are trying to take over the system and steal its secrets (The tables have turned compared to the first Coded Arms). There's dialog between you and your superior officers regarding mission progress, which makes playing the game actually seem more of a worthwhile experience compared to the original. The games graphical style is in keeping with the original too, but this time offers a more dynamic environment for you to virtually romp around in. The weapons available in game are your usual fare, shotgun, rifle, etc., but they can now receive upgrades! It'll be nice to see how much better blowing someone away with an upgraded shotgun is, as this time round the game is going to have up to 8 player multiplayer, over infrastructure (that's online play in English). Ooh yeah. The PSP hasn't exactly become a welcome home for first person shooting games due to the lack of twin analog sticks we know. We've yet to see the final control method for Coded Arms: Contagion but I'm hopeful that they've made it easier, or at least customizable. After all, do you remember playing Goldeneye fine on the N64? That only had one analog stick if memory serves. Konami will be letting us get virtually tooled up and fire off some data bullets in May. Whereupon we shall furnish you with a review.